If you’re like me, you’ve been getting a few notices from SchoolFeed, a Facebook app that makes a yearbook for everyone you went to school with. To me, this is a great example of an app that goes too far. From what I’ve read on the Internet–the most accurate source there is–as soon as you sign up for this app, it immediately sends requests to all your Facebook friends without telling you. This seems to be confirmed by the fact Hugo Award Winning author Robert J. Sawyer just sent me a request. Now, I’m a big fan of Robert J. Sawyer, and I’ve liked and commented on a few of his posts, and being a guy who’s very good to his fans, he’s liked and commented on a couple of mine. I hope that someday I will hit it big, and we’ll beta read for each other. But I have no illusions that if someone asked him how Shannon was doing, he’d either say, “Shannon who?” or think they were talking about some other Shannon he knew. I’m pretty sure he wasn’t sitting around thinking about classmates to add and landed on me, especially since we went to high school 15 years apart and in different countries. 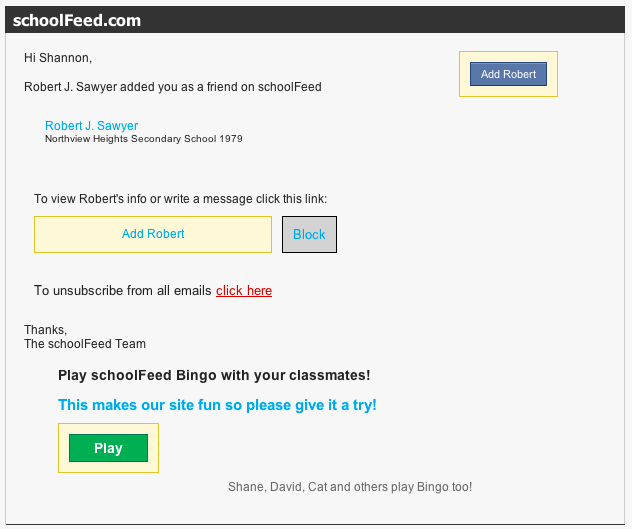 So no, Robert, I won’t be signing up for SchoolFeed. It’s nothing personal. I hope we can still be friends. This entry was posted in Computers, Writing on May 30, 2012 by shannon.